As Korea's economy stumbles, the government is looking to spend hundreds of millions on economic and cultural projects with its northern neighbor. The initiatives are seen as long-term investments to peace, but they threaten to inflate Seoul's debt load and may become a burden if inter-Korea relations hit a road-bump, experts warned. In a September bill to parliament, South Korean President Moon Jae-in government proposed spending $421.3 million for various North Korea-related ventures that include family reunions, a joint liaison office as well as sporting exchanges. Those commitments were first mentioned in a declaration signed by Moon and North Korean leader Kim Jong Un back in April. The $421.3 million figure refers only to 2019 expenditures, and opposition politicians have accused the government of deliberately concealing long-term costs for fear of public backlash. That's led to a delay in ratifying the bill. The multimillion-dollar proposals come as some grow increasingly concerned about South Korea's slowing economy. While the majority say they want peace with Pyongyang, many believe the domestic state of affairs should be a priority for public funds, especially at a time of weak growth. South Korea's full-year gross domestic product is seen at 2.9 percent this year, compared to 3.1 percent last year. Meanwhile, the pace of job creation hit its weakest level in nine years after Moon raised minimum wages and cut working hours — moves that have made it difficult for small and medium-sized enterprises to hire new workers. Public discontent with the economy actually pushed Moon's approval rating to 49 percent, the lowest level since he entered office in May, according to a Gallup Korea survey on Sept. 7. The leader's rating ticked up to 50 percent, however, in Gallup's following survey a week later. "Regardless of diplomacy, spending tens of billions of dollars in North Korea at a time when many South Koreans are unhappy with their own economy could be tough to sell politically," said Kyle Ferrier, director of academic affairs and research at the Korea Economic Institute of America. The Blue House, the office of South Korea's president, didn't respond to CNBC's request for comment. Of particular concern in the government's bill is the $263.8 million allotted for connecting and modernizing inter-Korean transport links next year. Some have suggested that figure will actually be much higher. Two railway projects in North Korea, Kaesong-Sinuiju and Kosong-Tumen River, are approximately 1,190 kilometers long in total, so the price tag is likely to be much higher, according to Anwita Basu, Asia country risk service manager at The Economist Intelligence Unit. The Korea Rail Network Authority, a government-owned enterprise, estimates the upgrade and repair of North Korea's dilapidated roads and railways could cost around $38.4 billion, the Chosun Ilbo newspaper reported on Monday. That figure accounts for around 10 percent of Seoul's total 2018 expenditure plan and is double what the government would be spending on its domestic job creation initiative, Basu warned. A June report from Citi assessed a cost of $63.1 billion for rebuilding North Korea's transportation and infrastructure, including railroads, roads, airports, sea ports, power plants, mines and energy refineries. Following Chosun Ilbo's article, a government spokesman said detailed cost estimates would be released once field surveys are completed. Seoul's infrastructure program could ultimately end up being "a white elephant that is used and abused by the elite from North Korea and ceases to serve its real purpose of integration," Basu continued. Any resulting jumps in the cost of projects could be embarrassing for Moon. "If he failed to accurately account for how much of a financial burden it would be for the ROK to invest in physical infrastructure, then it raises the question of what other areas Moon may have lacked proper vision," said Anthony Rinna, a Korea specialist at Sino-NK, an analysis website that covers the region. "He runs the risk of appearing to have overplayed his hand in terms of what's possible in reaching out to Pyongyang," Rinna continued. Some made that argument during February's Winter Olympics. Moon's decisions, such as allowing South Korean athletes to march alongside their northern peers under the Korean Unification Flag, revealed a leader who was pandering to Pyongyang, experts said at the time. But this time around, "there is much more pressure both internationally and domestically that the government doesn't simply provide free handouts to the North Korean government," said Kevin Gray, a Korea specialist at the University of Sussex, adding that bilateral projects were "carefully designed with mutual benefits in mind." Moon's spending plan, however, may provide some measure of economic benefit. The transport links "will be an added drag on South Korea's budget but it will also have positive spillovers via greater employment and manufacturing as the project is built," said Katrina Ell, economist at Moody's. "Longer-term, a more peaceful peninsula should have economic benefits that transcend the cost of the initial infrastructure build," she continued. The greatest benefit, many argue, is the international exposure that transport connectivity would bring. As Beijing and Moscow lead their own international economic integration initiatives, a direct link connecting South Korea with Chinese and Russian territory would mean easier access to wider markets, Rinna said. But anyone dealing with Pyongyang faces a major wildcard: The reclusive state has a history of unpredictable behavior. Should Kim revert to hostile acts, that would leave South Korea in a real bind. "If diplomacy falters after significant investments in North Korea have been made, the South Korean entities involved would stand to lose all of their money," said Ferrier. 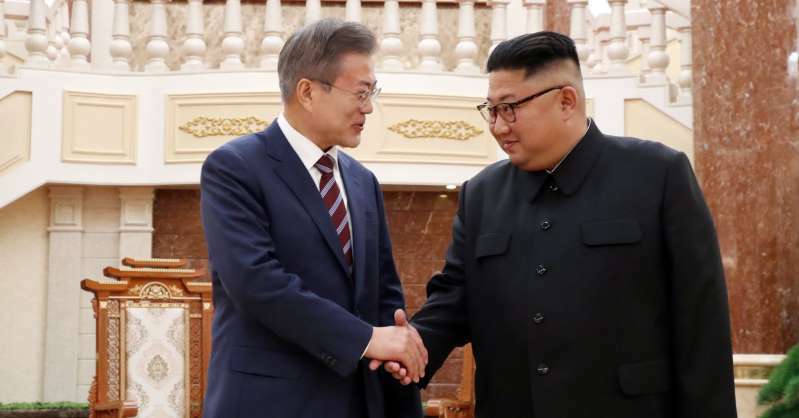 It only makes sense for South Korea to pursue inter-Korean railway and road projects once U.S. or U.N. sanctions on Kim's regime are lifted, Ferrier continued. Otherwise, companies involved in construction could face major financial consequences, he warned.